I’ve just watched Hans Fjellestad’s 2012 documentary Sunset Strip – a good exploration of that famous Hollywood thoroughfare otherwise known as Sunset Boulevarde. There are plenty of rock stars reminiscing and a lot of salacious detail. One theme that emerged for me was the paradoxical relationship between change and stasis. The Strip changed dramatically since the first club was built, with each entertainment epoch rise and ebb. But its extraordinary role as a place transformed from a rural road to somewhere where excess was largely tolerated with the speak-easys of the 1920s through to the next century. Police crackdown in the late 1960s notwithstanding, it seemed that the Strip was a place of perpetual carnivalesque inversion. .
Keanu Reeves referred to the Strip as a ‘sacred place’ and could still find resonances of the past there. However many looked back at their time and the places that defined with that with nostalgia and often some regret at the group and style that followed – fearing perhaps that the essence they cherished would be lost. Interestingly one event that had an impact on many was the closure of Tower Records around 2006. The building was a landmark that defined the Strip and the music it made available was pivotal to the culture of Strip visitors. Technology it seems had moved and people were no longer buying CDs in the volumes necessary to keep the huge outlet open. I watched Sunset Strip on DVD rather than by download rental. 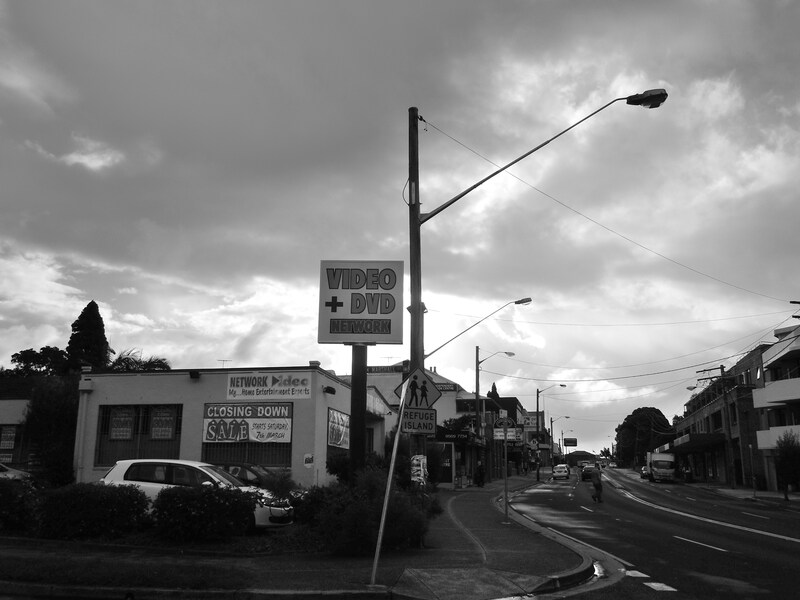 The transience of that tangible technology (ie a disc rather than a digital stream) and the reality of lost places became weirdly convergent almost immediately afterwards when I popped up to the local DVD rental store, Network Video+DVD in Sydney’s inner west. The staff told me store would close in a month or so. Their whole library was being sold. People were streaming from home not coming in to borrow. Faced with that I bought some documentaries I would not find easily on-line. Network is one of the only DVD rental stores left in Sydney. It has long been the best with an extraordinary stock and great staff (including the genial and knowledgeable Charlie who could pass for David Crosby’s twin). For this reason I thought it would live on indefinitely, providing a service to a niche but viable demand in a big city where such things should be possible. The apparent incontestable logic of the market has dictated otherwise. The news was upsetting. Network Video+DVD, as the name suggests, has been there a long time – it predates the digital age and my arrival in the area. It is an institution, and its demise will sadden many, for Network disseminated culture and connected people in a way not dissimilar to the local municipal library. DVDs, like books, can be discovered on a shelf in a way they usually are not by browsing a catalogue. Were the store to be replaced by homes, it's loss would be easier to accept for Sydney is in the grip of a perpetual housing crisis. But it seems that the Network site will become another liquor outlet – evidence that the market isn’t always ‘right’, as if that wasn’t already clear. The connection between the sense of loss and place has interested me for a long time because I feel it so often and hear it expressed by so many others. At its simplest it might be dismissed as ‘remember the good old days’ nostalgia, something I can find annoying and try to circumvent in my own reactions. There was a bit of this in the Sunset Strip memories. As an historian I'm also aware that there is some relativity about profound feelings of loss. Change has been a part of ‘Western Society’ for a long time. The poet Henry Lawson decried the ‘brand new throng’ who were displacing his local community back in 1909 – a time we now look on as one that was surely slower and conducive to close knit community. Indeed this sense has affected people for centuries. Oliver Goldsmith’s lamentation ‘The Deserted Village’ was written in 1770. But capitalism is dynamic – indeed ever more so since Goldsmith’s time. Places are disappearing or altered and damaged more quickly than ever. Environmental change intertwined with economics is increasing the pace. Change is now so fast it is hard to maintain orientation and perspective; so Australian academic Glenn Albrecht has identified a new malaise, ‘solastalgia’, a homesickness one feels while still at home – such is the swirl that envelopes us. It has, he argues, implications for mental health and social cohesion. Given the profundity of the forces involved, this all seems irreversible but Glenn clings to optimism: ‘as recognition of the damage that degraded and desolated environments do to our mental health increases, it is possible that we can respond more effectively to simultaneously restore mental and ecosystem health.’ I hope so. In the meantime I guess I'll be watching fewer DVDs. There is an introduction to Glenn’s ideas with specific reference to climate change at ‘The Conversation’.